Washington, D.C., circa 1916. There's no caption for this one so we'll have to improvise: "Allegory of Prohibition with cook, goat and ledger-toting old-timer in blackface." National Photo Co. Collection glass negative. View full size. Submitted by ref on Fri, 02/13/2009 - 2:55am. I can't decide if the cook is a red-nosed drunk or a blue-nosed Volsteader. Submitted by Dave on Thu, 02/12/2009 - 6:32pm. My guess is the goat has something to do with lust. As for the chef, maybe gluttony. For the geezer, any of the five remaining deadly sins. Submitted by stanton_square on Thu, 02/12/2009 - 9:48pm. To me it looks like a scene created by David Lynch - and I don't mean that in a positive way. The following articles offer one possible explanation of the presence of the goat: namely that it was a metaphorical symbol for the exertion of Congressional power to enlist the services of the D.C. police to enforce prohibition laws. 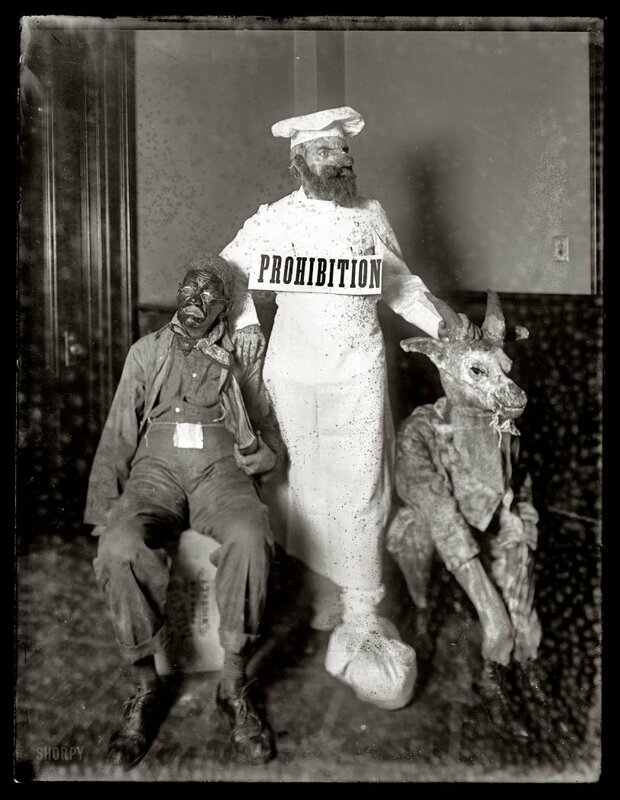 I'm not entirely convinced that this is an accurate inference for the photo; it's what popped up from a search of the Post archives for the combination of "goat & prohibition." Perhaps others can provide alternative interpretations. On the other hand, and maybe it is just as well, I offer no interpretation of the symbolism of the black-faced man with the ledger. Declares Scheme Would Make Them "the Goats"
The plan to clothe members of the District police department with the powers of the Federal prohibition agents is designed to make the department "the goat" for the Federal prohibition unit, and Commissioner Oyster "apparently swallows the scheme hook, line and sinker," Capt. W.H. Stayton, founder and executive head of the Association Against the Prohibition Amendment, charged in a statement made public last night. Representative Cramton, of Michigan, House dry leader, Capt. Stayton said, "realizing that prohibition can not be enforced in Washington, is seeking to relieve the Federal prohibition unit from criticism of the drys and have the blame placed on the District police department." Full powers of Federal prohibition agents for members of the police force will meet the with full approval of H.M. Luckett, chief enforcement agent, said yesterday such a plan as proposed will take a great burden from the local unit and free the men for more important work. Under the present plan the Federal agents must constantly be called from important cases to be present at the arrest of a petty violator of the law, Luckett declared, and in such cases, if the police were clothed with the authority of Federal agents the presence of a prohibition officer would be unnecessary. "He is talking through his bonnet." That was the reply yesterday of Maj. Daniel Sullivan, superintendent of police, to the statement of Capt. W.H. Stayton, founder and executive head of the association against the prohibition amendment, that the plan to invest district police with all the authority of Federal prohibition agents was fostered by dry leaders to make the police "the goat" for the failure of the Federal enforcement machinery. Submitted by Anonymous Tipster on Thu, 02/12/2009 - 5:31pm. It's a lost scene from "The Shining." Submitted by Anonymous Scaredycat on Thu, 02/12/2009 - 4:57pm. Those three are freakin' me out! Submitted by sjmills on Thu, 02/12/2009 - 4:29pm. Freaky characters on this moldy old photo. It could be cover art for a Marilyn Manson or Nine Inch Nails album, or even a Rob Zombie movie. What an incredible image.